Will Sealing My Slate Tiles Alter Its Authentic Colour? How to choose perfect marble tiles for flooring your new house? Before You Install Slate Floor Tiles - Consider These Aspects! Why Homeowners Trust Limestone For Their Flooring? After cleaning granite tile Mr, Hamid assigns a job to clean marble tile. First of all, thank Hamid to choose me as a fit person for this job. I will try it at my label best. A few days ago we learn about the safety of granite tile and cleaning of granite tile. Today I came with marble tile, the safety of marble tile and cleaning of marble tile. As we know marble is an extremely durable material which gives a luxurious look of your flooring work and the variation of this tile such as mosaic combination gives a unique look of your property. That’s the region interior designer mostly choose marble tile for flooring work. But apart from it you need to take a proper step to retain its natural luster by using little regular activity. So if you want to keep marble tile in a mint condition then follow the following safety leaning tips. The first and foremost step for cleaning a marble tile is to dust off all the dirt and debris with a soft duster. Get hold of a soft and fluffy dust mob and sweep the marble tile with it ti remove all the dust efficiently. Using a microfiber duster will just be fine. While seeping take care that you do not grind the small dust particles against the tile. Continuous grinding can lead to scratch marks on the tile. Make this cleaning a weekly routine to avoid dust build-up and easy cleaning. After this dust cleaning, it is a good practice to vacuum clean the floor. However, make sure that the wheels do not have broken edges as that can again lead to scratches. Wrap the wheels with a soft cloth for such cases. Also remove any metal attachments, if any, from your wheels while vacuum cleaning your marble tiles. After the dry cleaning procedures, you can wet mop your marble tiles. However, do not use any harsh acid or base for the same. Use mild cleaning solutions. Ensure that it is pH neutral. Harsh chemicals will corrode the marble tile and with time will lead to peeling off of the same. Also, never use home reagents like lemon, vinegar or baking soda solution for cleaning stubborn patches. Practice regular cleaning habits for easy cleaning with fewer efforts. Once done, mop your floor dry. Avoid standing water sloshing and excess water on your marble tiles. These can lead to the development of water spots which will with time become permanent. 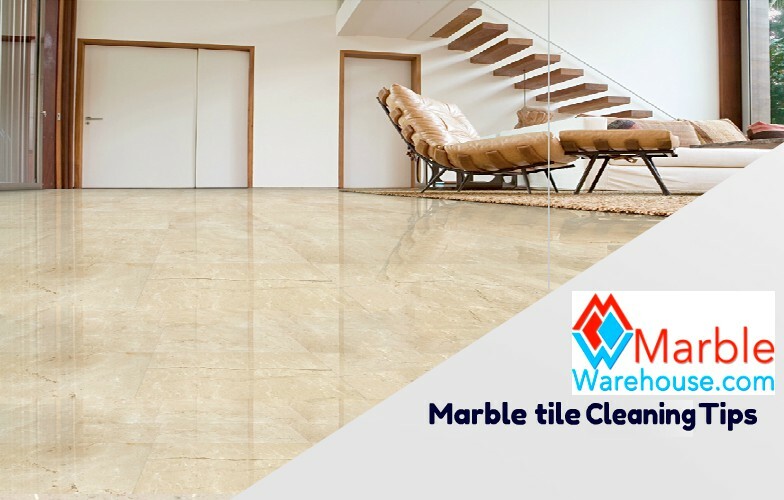 Mostly Kitchen and Bathroom is the prefect zone where your marbles tile is stained by mold, food or any other oil-based products, which you need to clean on regular basis with soft cloth and normal water. Do it on regular basis and it is easy to clean after finish the lunch or dinner. If you miss it regularly than you need to use cleaning solution (acetone, mineral spirits, ammonia or bleach), water, and a gentle cloth for remove it. You may find it at your local market or available at our online store. Be careful never mix cleaning solvent to each other. It may harmful for your marble flooring. It is easy if you use a quick step at the time when you notice blots of paint on your marble tile. Use a clean cloth or thin blade and lacquer to gently scrape it off. Suppose you are gating late with this thick paint than you have to then you need to use commercial-grade paint stripper which you can find at our online store or any hardware shop in your local area. Take extra care at the time of cleaning about scratch the natural stone. Use Soft Cloth Instead of Scrubby Sponge Always use soft cloth instead of scrubby sponge if you are going to wipe a small area of your marble tiles because scrubby sponges are made of steel wool which may scratch your marble surfaces.